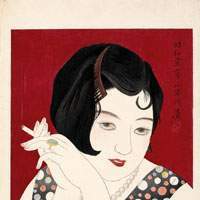 The Taisho Era (1912-1926) saw young habitues of Japan’s cafe society challenging and outraging their parents as they danced, smooched and smoked cigarettes, aping their idols of the silver screen. Emblematic of the age was the moga (modan gaaru, or modern girl) with her Western shoes, dresses, makeup and jewelery, and her stylish hair done in a marcel wave. The moga was escorted by her mobo (modan boi, or modern boy), dapper in the latest Western fashion, but it is the women — then, as now, of endless fascination for the artist — who are mostly portrayed in the exhibition “Taisho Chic” at the Teien Museum. 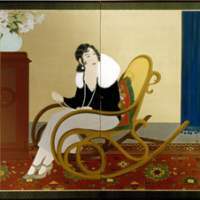 At that time, Japan had already proven itself adept at mastering Western technology and, in addition to flexing its military muscles, was beginning to look at some of the fun spawned by the Jazz Age in America and Europe. Democracy, socialism and the beginnings of sexual equality were emerging forces, and with basic, nationwide literacy, all classes could participate in a lively intellectual climate where entrenched beliefs and values were being questioned in the light of imported Western ideas. Taisho modernism was essentially an urban culture. There was a huge social gap between the affluent and the rest of society, and pictures of rural scenes suggest Arcadian resorts that were tamed for the visits of city sophisticates, such as Hayama and Karuizawa. Women took up outdoor activities and were seen on the summer beaches in form-fitting swimsuits with arms and legs exposed — a far cry from the dental-floss creations of today, but provocative for the time nevertheless. For the first time a carefully managed suntan denoted outdoor games rather than the rustic servitude that was the lot of most country folk. The integration of modernism and Japanese tradition was relatively painless for some progressives. A painting by Kafu (date unknown), of two girls seated on a beach, reveal such a comfortable accommodation. Both are dressed in the latest fashions: one in a kimono with long hair, and the other with short hair, wearing a green velvet dress and strapped, black shoes. Further hinting at the East-West association are the sails of a clipper-ship and a modern steamship puffing smoke on the horizon, while a rather battered-looking traditional fishing boat lies grounded. It is obvious that these are well-groomed young girls from respectable backgrounds, and certainly not lacking in self-assurance. A more mature self-confidence can be seen on the faces of the three eldest daughters of the industrialist Kuhara Fusanosuke (1869-1965), portrayed with a luxurious car resembling the 1930s Chrysler “Royal Sedan,” in a screen painting by Yamakawa Shuho. The girls are in fashionable kimono, their hairstyles are perfect, and their tabi socks immaculate. One stands with her hand resting on the hood in a gesture of casual possession, while clutching the strap of a leather-cased 35-mm camera — probably the latest, expensive Leica. Their gaze is cool and almost expressionless, revealing just the slightest curiosity at the scene, but secure in the knowledge that it will be kept at a safe distance. The background is uncluttered by scenery or context, as if it had been made in a studio, and, by depicting just the well-brought-up girls and their splendid car, Shuho’s painting emphasizes exclusive wealth and privilege. From the top of the social tree, these young ladies could afford to handle Western accouterments and ideas on their own terms. For many of the wage-earning classes, any foreign import presented fuel for conflict with conservative and xenophobic parents or peers. Moga, and the denizens of the cafe society generally, had to defend themselves against frequent charges of not being “properly Japanese,” and were held for comparison against the idealized, kimono-wearing, subservient housewife who stood for all that was proper in family life. Popular magazines came out with arguments on all sides, and even the government — with military values in mind — began to eulogize the new, healthy-looking young woman who could swim and play tennis. The traditional woman was therefore gradually remodeled, and the “compound bijin” (beauty) appeared, who was just as comfortable in traditional kimono as in the latest Western fashions. 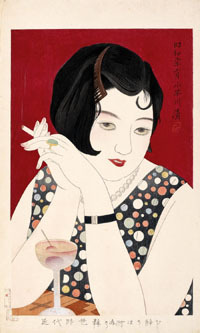 The girl in the print titled “Tipsy,” by Kobayakawa Kiyoshi (1899-1948), with cropped hair, a fashionable spit-curl, lipstick, cigarette and what is probably not her first drink of the evening, obviously had no fear of being judged as the “wrong” type of modern woman. “Mrs. 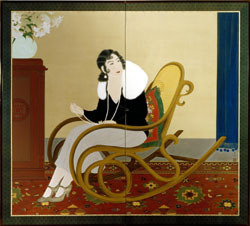 T” portrayed in smart Western clothes and seated on a rattan rocking chair in a screen painting by Wada Seika (b. 1899), radiates absolute confidence in asserting her style and — no doubt — could stand up for herself against any critics. Because so much of Taisho culture was urban, few paintings survived the destruction of cities during World War II. What did remain was largely overlooked by art dealers or collectors and, as has happened before with netsuke (carved figurines), ukiyo-e prints (woodblocks) and late-Edo paintings, it took a foreigner to recognize the quality of these treasures. “My first thought was ‘How exciting, this must be Japan’s earliest modern art!’ ” says Texas-born collector Patricia Salmon about Taisho Era painting. “It was a wonderful mixture of East and West of which the Japanese art dealers and even my own friends in the field were unaware.” Salmon quietly collected many of the masterpieces in this exhibition during her years in Tokyo. Nobody else was interested at the time, and she had to research them in more-or-less detective fashion as there was so little information available. Sharp-eyed curators in America later took notice and now most of her collection is in the Honolulu Academy of Arts and the Art Institute of Chicago. There could be no more appropriate venue in Tokyo for this exhibition than the Teien Museum. Built in 1933 as the residence of Prince Asaka, son-in-law of the Meiji Emperor, the building is a jewel of art deco architecture complete with original detailing and fixtures. The small rooms and subdued lighting superbly enhance the perfumed, nostalgic mood invoked by the displayed paintings and prints, as well as the exquisite decorative arts of the period. Old Hibiya barflies will have memories rekindled by a molded terra-cotta tile from Frank Lloyd Wright’s Imperial Hotel, so sadly demolished in 1967. Kimono show the startling new designs that reflected the age: one covered with colored hearts, another with round and spiky forms that suggest cocktail stirrers, or some kind of radio antennae. Tokyo’s fashionable young trendsetters are always on the lookout for design ideas, retro or otherwise, so what’s the bet we’ll be seeing marcelled hairdos around Aoyama sometime soon?